Lobstering is not without danger. 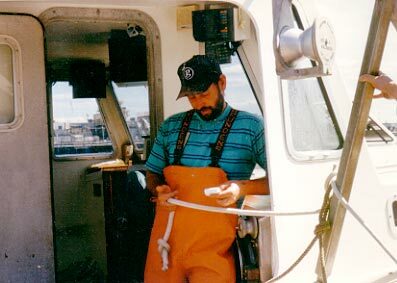 On a trawl, each trap is connected by a length of line. As the boat moves forward, the weight of the previous traps drags the following traps into the the water. If you get a hand or foot tangled in a line as it plays out, there's a good chance you'll end up in the water with several hundred pounds of gear dragging you to the bottom. Add the fact that the Atlantic is a cold ocean (especially in winter) and you can start to imagine just how bad a bad situation can get. Hence, oversized boots and gloves should be worn. When asked if he'd ever gone over the side this way, one fisherman replied,"Nope, but I've come home with a missing boot before.". Accidental deaths do occur while tending traps on the water. Usually the victim is out working alone. Today in the waters off southern Maine the majority of lobsters hauled in any given trap are released because they are not of legal size or they are 'V-tails' . An average of two legals in a trap is considered a good catch. Maine has taken the V-notch law a step further by adopting a new 'zero-tolerance' law which makes any female with any deformity of the flipper to the right of the middle flipper, no matter how slight, illegal to take...even if the deformity is obviously due to natural causes. 15 - 20% of legal lobsters are released in Maine because they are V-notched females. Many more are released because they are either too small or too big. By law each trap is required to have vents which allow smaller lobster (and other marine life) to escape the traps. In fact, many legal sized animals can and do escape through these vents. It is illegal to remove any gear found washed up on the shore, no matter how badly damaged. Lobstermen periodically collect their stranded gear from beaches and shore line. Most gear bears identification of some sort so the owner can be notified. The item most frequently stolen are the buoys. Every lobsterman has a unique color scheme for his buoys. The markings are unique for the state that issues his license, but may not be unique between states. In general, lobstermen from one state may not fish waters of another state within 3 miles of shore. Maine lobstermen fishing more than 3 miles off another state's shore must still abide by Maine state lobstering regulations - some of the most conservation-oriented regs in New England. It is illegal in the state of Maine to catch or possess an 'over-sized' (>= 5" carapace) lobster. It is legal for dealers to buy them from out of state and store them in Maine, but they may not be resold in the state of Maine. Some fishermen believe that the over-sized animals represent the breeding stock and are happy not to take them. It is illegal in the state of Maine to possess any part of an illegal lobster...even a shell that has been shed and discarded by an illegal-sized animal. Some full time fishermen go out on the water year round. If they are not tending or setting traps, they are hauling them in for repair. Either way, in the dead of winter the sea spray can coat the decks and rails with ice and slush making the job both dangerous and uncomfortable, especially in rough seas. The captain checks his tide table. The harbor is on the Piscataqua River . It is said, during spring tides the tidal currents make these waters the third swiftest in the world so knowing when that is going to happen is important to safely navigate these waters (as one cruise ship captain found out (the hard way) recently). It is estimated that an average of 15-20% of a lobsterman's gear is damaged by trawlers, barges, and other large vessels annually. In high traffic areas the damage can be much higher. Most of the time the lobstermen manage to retrieve their gear, but sometimes the traps have been destroyed beyond repair by being dragged along the sea bottom. One of the tugs escorting this tanker out of the harbor took out one of our buoys while maneuvering to return to port. The traps were retrieved from the second buoy and the line repaired. This is the reason for two buoys on river gear . A lobster trap can cost over $100. In Maine, traps may be set at anytime. However, between June 1 and September 1, no traps may be hauled after 4pm on Saturdays and at no time on Sundays may they be hauled. During the rest of the year traps may be hauled seven days a week until sunset. 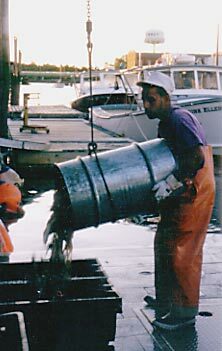 In 1996 there were only 144 lobstermen in Maine that tended 1200 or more traps. Today there are fewer. 5 a.m. Loading totes with bait. The bait is mostly herring. 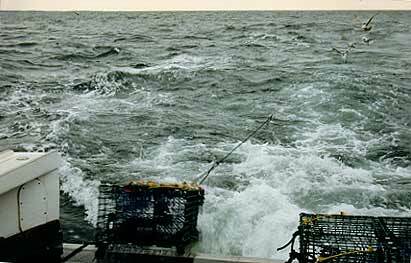 At $30 a barrel and 5 to 8 barrels a day, a full time lobsterman can incur overhead of tens of thousands of dollars per year in bait alone. Primarily, banding the 'keepers' insures that they don't injure each other in the live-tank. While not cannibalistic in the wild, lobsters will not hesitate to make a meal out of their fellow lobster under crowded conditions. 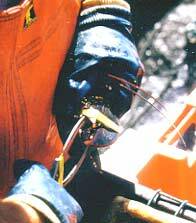 It also keeps your fingers out of those vise-like claws when it comes time to empty the live-tank. This is how NOT to band a lobster. Holding them upside down tends to make them nervous, and a nervous lobster is more likely to drop a claw resulting in a cull. Handling gear is not always as straight forward as you may think. Click here to see what I mean.